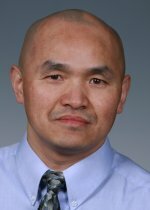 Congratulations to Dr. Hongjun Jin, a biochemistry postdoctoral fellow at Pacific Northwest National Laboratory, who recently won a U.S. Department of Defense postdoctoral fellowship for breast cancer research. In this 3-year, $250K project, he will determine post-translationally modified biomarkers for the early detection of breast cancer. The research will further strengthen PNNL's protein microarray platform. Thousands of top breast cancer postdoctoral researchers from across the U.S. applied for this fellowship, out of which 43 were recommended for funding. Jin, who joined PNNL in 2008, received his Ph.D. in biochemistry from Texas A&M University and bachelor's degrees in Radiochemistry and Medicine from Lanzhou University and Bejing University of Chinese Medicine, respectively.